3-Nitrotyrosine, the product of interaction between the free tyrosine with nitric oxide, is characterized by its posttranslational incorporation into carboxyl terminus of α-tubulin molecule via tubulin-tyrosine ligase, similar to unmodified tyrosine residue. However, α-tubulin C-terminal nitrotyrosination is irreversible unlike an enzymatically regulated tyrosination/detyrosination cycle. The nitrotyrosination of α-tubulin results in an appearance of some changes in animal cell morphology and their microtubule organization, a loss of some cellular functions, and in intracellular redistribution of cytoplasmic dynein. Since, nitrotyrosination in plant cell has not been investigated, the aim of our study was to reconstruct the spatial structure of nitrotyrosinated plant α-tubulin with following modeling of possible mechanisms of this posttranslational modification influence on cellular processes. The last 10–12 amino acid residues of α-tubulin C-terminal region, unlike the main part of the molecule, form a free oscillating tail that can be considered as individual structural domain. 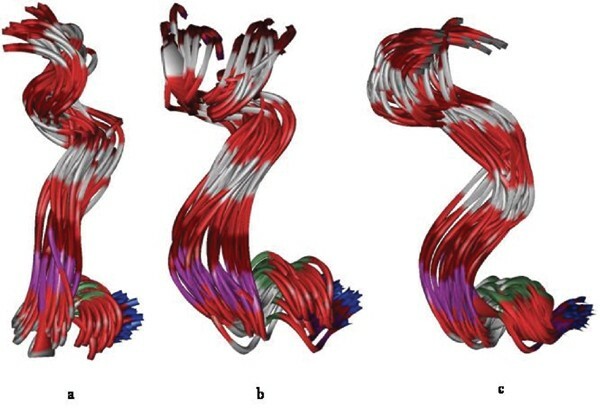 The results of reconstructing the spatial structure of detyrosinated, tyrosinated and nitrotyrosinated goosegrass (Eleusine indica (L.) Gaerth.) α-tubulin forms and studies of their behavior testify that these modifications change substantially the level of mobility of flexible α-tubulin C-terminal domain. We found that tyrosination increases substantially the mobility of C-terminus (see Figure 1). The root mean square deviation (RMSD) in coordinates of amino acid residues composing this region grows from 0.48 A for detyrosinated form, to 0.55 A for tyrosinated α-tubulin as was calculated on the basis of molecular fluctuations trajectory in 500 ps interval. These results correlate with data about predomination of detyrosinated α-tubulin in long-time living microtubules and vice versa. The breakdown of tyrosination/detyrosination cycle due to incorporation the nitrotyrosine into C-terminus should resulted in predomination of short-time living microtubules over long-time living microtubules. It is necessary to note that mobility of nitrotyrosinated terminus is lower than the tyrosinated one, but it is higher than the detyrosinated terminus. In the last case RMSD is 0.52 À. It can lead to the appearance of microtubules with a certain "intermediate" lifetime and, as a consequence, modify the microtubules organization in cells. It is known that the tubulin C-terminal region is responsible for interactions with structural and motor MAPs. In combination with the above mentioned data about the redistribution of cytoplasmic dynein after nitrotyrosination of α-tubulin we can speculate that nitrotyrosination can influence processes of tubulin-MAP recognition and interaction. This assumption is confirmed by our results on modeling the interaction of α-tubulin with the MT-binding domain of dynein heavy chains. The high content of dicarboxylic amino acid residues, especially glutamate residues, is the hallmark of the flexible C-terminal region of both tubulin subunits. It has to be correlated with the necessity of presence, a surface enriched with diamidate amino acid residues in the dynein MT-binding domain structure. The surface of dynein MT-binding domain formed by residues Lys3148, Lys3151, Lys3154, Lys3155, Arg3162, Lys3287, Lys3300, Arg3327, Lys3328 is correspondent to this factor. The surface is flanked by residues Asp3144, Asp3146 and Asp3320, Asp3321 on both sides. Included in nitrotyrosine nitro-group possesses an additional negative charge, that is not typical for dynein-tubulin interaction, and locates close to flanking residues. This location results in a strong decrease in the affinity between the dynein contact surface and α-tubulin C-terminal region.